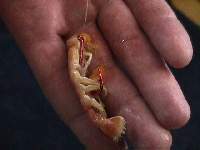 For a number of years, we have preferred to use sandshrimp rather than eggs for our bait of choice for steelhead fishing here on the rivers of the Olympic Peninsula. This isn't necessarily because we feel that shrimp are a better bait. We feel that both perform about equally as well but the shrimp are easier to use when rigged properly. Below you will find a description of how we like to rig the shrimp onto the hook to provide maximum durability on the hook. 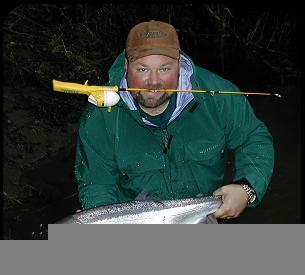 Despite the handicap of the Snoopy Rod (in the Annual Snoopy Rod Classic), Kevin finds an early Olympic Peninsula wild steelhead that couldn't resist his sand shrimp offering. 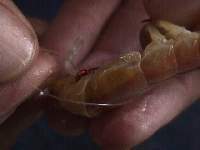 First of all, break off the tail of the shrimp near the junction of the tail (We use the tail only) and insert the hook (preferably 1/0 or 2/0) nearest the body end of the tail about a third of the way down the tail section. We then thread the hook down the tail section until the hook point pops out the underside as seen in this picture. It's important that the shank of the hook is parallel to the long axis of the tail or the tail section will spin wildly which results in twisted leaders. 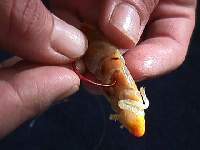 Next, take your bait loop tied into the hook (remember the last tip??) and place it around the tail section and pull tight, try to allow the loop to rest on a section of the shell rather than in one of the joints, otherwise, it'll have a tendency to cut through the bait. Voila!! A finished shrimptail bait! Use this in combination with your favorite drift bobber above the hook. If rigged properly, you can easily get twenty or thirty casts from a tail section like this before rebaiting ... that is of course, if you don't have to rebait after catching a fish! !